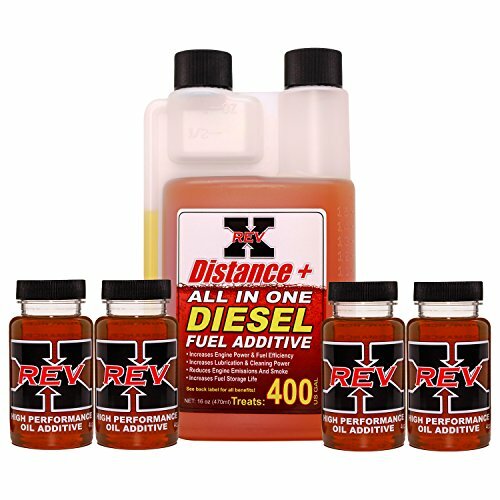 REV-X Diesel Engine Complete Treatment system will treat up to 32 quarts of oil and with our Distance plus diesel fuel treatment you can treat up to 400 gallons of diesel fuel. Rev X produces the highest performing oil and fuel additives available. By creating a technology that dissolves instead of destroying seals and other vital parts with chemical strippers, it can safely clean and may even fix both fuel and oil injectors in most vehicles. If you've been looking for an oil additive that ramps up the performance of any lubricating fluid, without any of the harmful additives used in the past, your search is over. Rev-X High Performance Oil Additive has proven worldwide to outperform all other products while surpassing all expectations. Rev-X High Performance Oil Additive was formulated to be the highest performing oil additive available at any cost with zero downsides. Rev-X High Performance Oil Additive can be blended into all types of lubricating fluids for the ultimate friction reduction agent that virtually eliminates high thermal temperatures within treated components providing extended service life for all component and lubricating fluids. DISTANCE+ Diesel Fuel Additive is simply the most cost effective, complete high performance diesel fuel additive available for any diesel-powered equipment in summer conditions. When you are looking for the highest quality summer fuel additive for today's ultra low sulfur diesel fuel, you need to look no further than our DISTANCE+ Diesel Fuel Additive. The DISTANCE+ Fuel Additive was formulated to be a true all-in-one ULSD fuel additive that requires NOTHING else to be added. DISTANCE+ Fuel Additive boosts ULSD fuel performance to a level that diesel owners simply have not had the opportunity to purchase. Clean up stiction in injectors by dissolving the problem, not by damaging your engine with harmful chemical strippers. Reduce friction to increase power and torque while reducing engine temperatures. Distance+: Formulated for all ULSD & bio-diesel fuels. Greatly Improves Starting In Cold Weather down to 0º F.
Manufacturer: Rev X Products, Inc. Publisher: Rev X Products, Inc. Studio: Rev X Products, Inc.
View More In Engine & Oil. If you have any questions about this product by REV-X, contact us by completing and submitting the form below. If you are looking for a specif part number, please include it with your message. SealLube - Seal Expander - Case of 12 / 8 oz.